Last week the trial’s Principal Investigator, Rohit Ramchandani arrived in Zambia to oversee the final survey of the trial. This blog post has been put together using pictures from last week’s training of enumerators and notes sent in by Rohit following the first couple of days in the field in Katete District. It’s incredible that nearly 12 months has past Rohit reported on the training for the baseline survey and six months since the midline (6-month) survey. Training went very well, and followed a similar curriculum to the training conducted at midline. 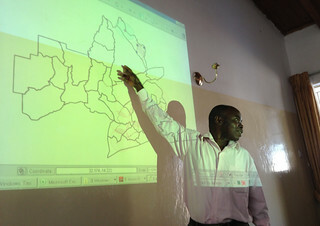 This included sessions on the background to the COTZ, an overview of the partnerships and stakeholders, diarrhoea and its treatment (Zambian and global contexts), research ethics, logistics and tips/etiquette for working in the field, research design of the COTZ evaluation, relevant research and sampling methodology, and a heavy emphasis on understanding and using the research tools – household survey, retailer survey – including a day of field testing in Chimbombo, Central Province. After an intensive week of training, the research teams – 4 of them, each with 5 enumerators and 1 supervisor – headed into the field on Sunday (18/8/13), almost exactly 1 year after collecting baseline. 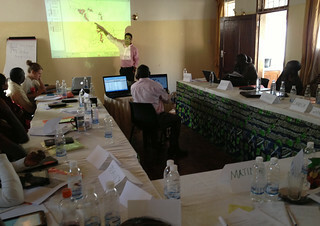 It seems like just yesterday that we were introducing the Kit Yamoyo to communities for the first time. We arrived in Katete around 8pm, about 6.5 hours after leaving Lusaka and got settled in. I stayed at my usual accommodation in Katete – Benzu Lodge – a very simple, cost-effective spot just outside the centre of town not too far from our COTZ field office established by Keepers Zambia Foundation. Obviously, these data are very, very preliminary but they are reassuring nonetheless. 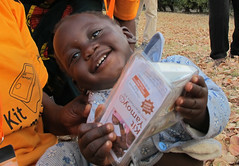 After 6 months, 40% of mothers with a child with diarrhoea in the last 2 weeks had treated it with Kit Yamoyo. A big achievement. But then we stopped distributing vouchers and sales fell – Simon reported on this and explored reason’s for it here. One suggestion was that we’d flooded the market and that many people had un-used kits in their home and so they didn’t immediately need to buy another one when diarrhoea struck a second time. These preliminary figures would seem to support this – 82% of mothers who used Kit Yamoyo used one they already had in their home. Visited the shop of Lawrence L. He was not available, as he had gone to Katete town to purchase goods. His wife noted that he had not been stocking Kit Yamoyo since April, as diarrhoea rates and demand were both low. However, in the past few weeks, diarrhoea rates have started to pick up again, as has demand. We were also informed he was replenishing stock during his current trip to town. Arranged to come back and interview him tomorrow. One enumerator interviewed a mother with two under 5s who had not had diarrhoea in the past 2 weeks, however, her 7 year old did and she used Kit Yamoyo. She already had the kit at home, which she had acquired previously using a voucher. One enumerator spoke with a mother who had previously acquired a Kit Yamoyo using a voucher. She kept it at home with plans to use it if one of her children were to get diarrhoea. She ended up getting diarrhoea before any of her children did, and used the kit herself; however, she only used the zinc, not the ORS. She did not complete the 10-day zinc regimen, but used it for 3 days, 1 tablet per day and recovered. Spoke with the retailer Eddie M. who has not purchased Kits since Nov 2012. He said that his father had fallen ill. Eddie had to save up money and take his father to Lusaka for treatment. This reduced his available capital for purchasing Kit Yamoyo. 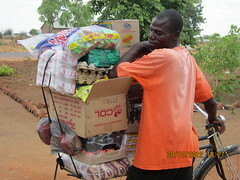 He said that after harvest, he would like to resume stocking and selling Kit Yamoyo. Cited data are interim results from the endline evaluation and do not reflect the final report. Final calculations may vary.